Leadmeter is available on specific Lead Page templates looking to capture leads. Therefore, you won't see Leadmeter on sales, consultation, thank you pages or site templates. Turning Leadmeter off is done at the page level, meaning you can choose to have it display while you're editing one page, but have it turned off while editing another. Leadmeter is located at the top navigation bar of the Lead Page builder. Click on it to review any checks you might have missed while building your page, or view the entire checklist altogether. Any checks you missed will be presented as "Top Issues" along with their priority (high, medium, low). To view the complete checklist, simply scroll to the bottom of your top issues and select "View All." From the "Top Issues" view in Leadmeter, you're able to click on any of the checks you missed, sorted from high to low priority. Once clicked, you'll be taken directly to the specific spot on your page where you can resolve the conflict. For example, no opt-in form on your page? Click the issue in Leadmeter and the widgets pane will open up in the builder to show you to the form widget. Too long of a headline? Click the issue and the conflicting headline widget will be illuminated for you in the builder. 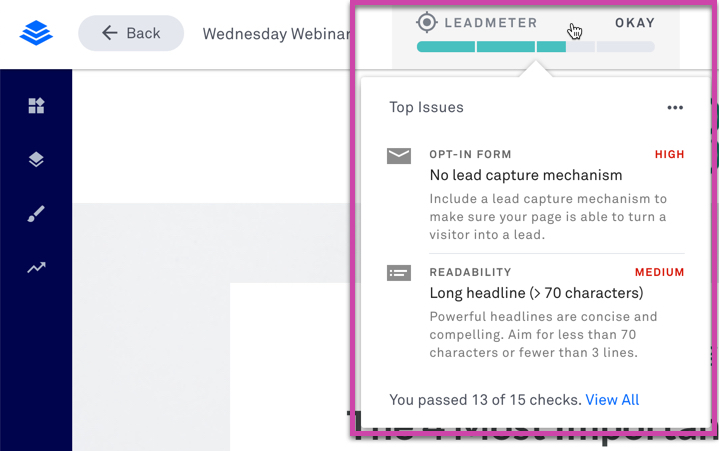 Leadmeter makes 14 checks while you edit your pages. Below you'll find the entire checklist as well as the description provided in the page builder for each check when your page falls short of meeting it. The checklist is categorized by Layout, Call-To-Action, Readability, Opt-in Form. This category of the checklist revolves around the foundational elements on your page and whether they're helping or hurting your page's ability to convert. Fewer than 3 videos - Too many videos can make your page load slowly and cause visitors to click away. Fewer than 2 videos - Too many videos can make your page load slowly and cause visitors to click away. Countdown window is brief - For a countdown timer to add a sense of urgency, it has to offer a limited window of time. Try shortening the length of your timer. This category of the checklist focuses on buttons calling a visitor to opt in to your page. Button is easily readable - Without enough color contrast between the text and button color, your visitors will have a hard time reading it. CTA has fewer than 24 characters - 24 characters or less is the ideal length for your call-to-action button. CTA text drives action - Try customizing your call to action with something more attention-getting, like: Let me have it! This category of the checklist has an eye on your text copy, encouraging you to stay concise with your message. Bulleted list is concise - Lists that are too long clutter a page and confuse readers. Try restructuring your content for better readability. Odd number of bullets in list - Ever noticed that nature comes in odd numbers? So should bulleted items on a list...they just look better. Concise headline (<70 characters) - Powerful headlines are concise and compelling. Aim for less than 70 characters or fewer than 3 lines. This category of the checklist is all about your forms and what you're asking of your visitors in order for them to opt in. Includes lead capture mechanism - Include a lead capture mechanism to make sure your page is able to turn a visitor into a lead. Fewer than 3 form fields - The more information you ask for, the less likely a visitor is to opt in. Try keeping your form fields down to a bare minimum. Fewer than 2 form fields - When it comes to form fields, less is more. Optimize your email capture form by including no more than 2 fields. Correct use of phone field - When it comes to form fields, less is more. Only ask for your visitor's phone number if you need it to conduct a free consultation. Correct use of in-page form - For best results, try using pop-ups for all your incentive offers (other than a newsletter sign-up). Click on Leadmeter next to your page's title in the page builder. Select the more at the top-right corner of the Leadmeter menu, then "Hide Leadmeter on this page." 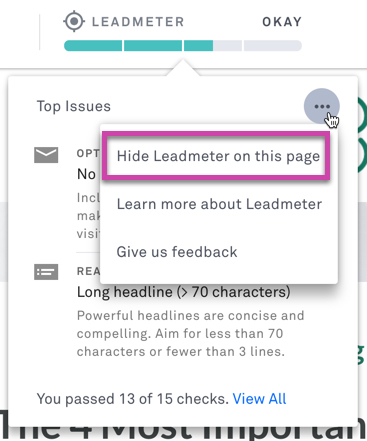 Leadmeter will automatically be turned on when creating a lead capture template, therefore, if you're not seeing it at the top navigation bar inside the Leadpages editor, it's possible Leadmeter isn't available on that template. However, if you've turned Leadmeter off on a page, and would like to turn it back on, you certainly can. Click on the ⌖ at the top-right corner of the page builder. Select "Show Leadmeter on this page." 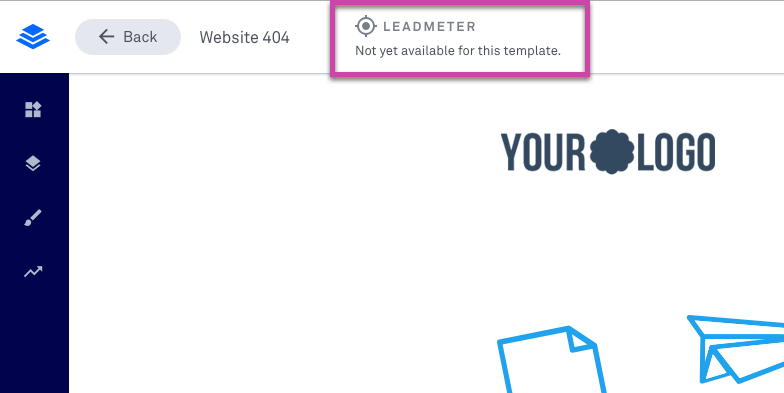 Why does Leadmeter say it's "Not yet available for this template?" If you're using a template that's meant to do something other than capture leads, such as sales, 404, or thank you pages, you may see a message like the one below in Leadmeter while building that page. We will be building out a different checklist for these types of templates as they have different types of goals than those that capture leads. What should I do if Leadmeter keeps telling me I didn't meet its checks but I just want to use this template for something other than lead capture? That's totally cool. Being that our builder is highly customizable, you might take a template that was originally intended to capture leads and turn it into a thank you page etc. In those cases, we'd recommend simply turning Leadmeter off, following the steps above.